Maurizio Sarri stole the headlines after Chelsea’s disappointing defeat at the Emirates, but the Italian’s post-match attack on his own players’ collective attitude couldn’t overshadow a crucial three points for Arsenal. Unai Emery’s side started the day six points behind their fourth-placed opponents, but the Gunners were faster out of the blocks and took an early lead when Alexandre Lacazette controlled and shot hard past Kepa after 14 minutes. Chelsea were typically patient in possession, but Jorginho failed to influence the game as he can and Eden Hazard once again looked out of sorts as a false nine – and things got even worse for the visitors when Laurent Koscielny shouldered in Arsenal’s second shortly before half-time. The second-half introduction of Olivier Giroud finally gave Chelsea a focal point in attack, but Sarri’s changes didn’t convert to goals and his team are now only three points clear of both Arsenal and the rejuvenated Manchester United in the table. 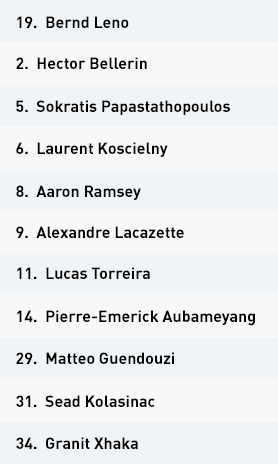 Unai Emery set his Arsenal team up in a 4-4-2 diamond, with Granit Xhaka the single pivot and Aaron Ramsey in the number 10 position behind Alexandre Lacazette and Pierre-Emerick Aubameyang. Hector Bellerin provided width on the right, which saw Willian drop back to limit access into him. From here, Mateo Kovacic stepped forward on to Arsenal’s right centre-back – Sokratis Papastathopoulos – but this left Lucas Torreira free to advance forward from the right of the Arsenal diamond. 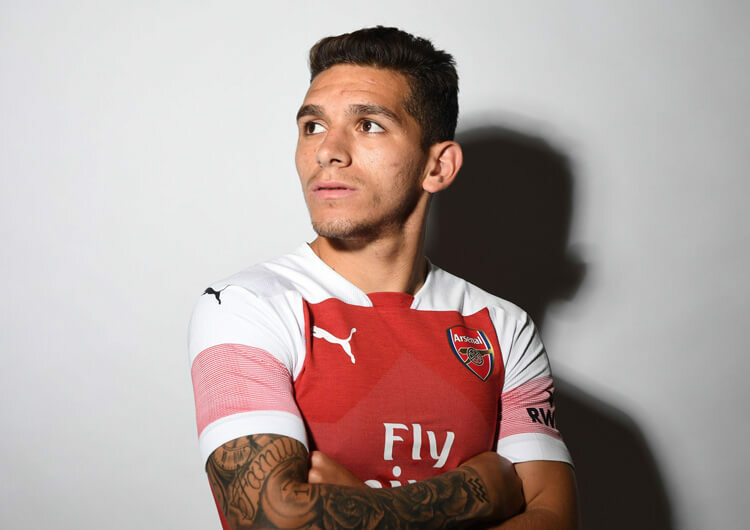 With Jorginho and N’Golo Kante wary of the combined threat of Ramsey and Matteo Guendouzi, and the forward movements of Lacazette keeping both David Luiz and Marcos Alonso busy, Torreira soon became Arsenal’s most consistently free attacking outlet. Sead Kolasinac also moved high on the Arsenal left, with Guendouzi dropping into the false full-back role – but with Cesar Azpilicueta less attack-minded than Alonso, Chelsea remained more compact on that flank. It was no surprise when Arsenal’s opener came from the right, then – Lacazette controlled Bellerin’s ball neatly before turning and hammering past Kepa at the near post. With Chelsea starting to dominate possession, Ramsey pushed right on to playmaker Jorginho. 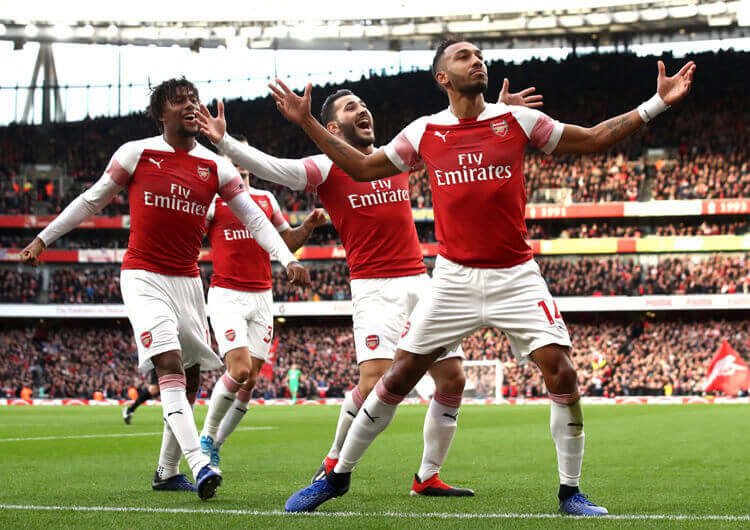 While this gave the visitors more chance of playing round the Arsenal mid-block, it also gave the hosts a third runner high up the pitch, meaning they could launch quick and direct counter-attacks. Despite this, Arsenal’s second – scored by Laurent Koscielny, off his shoulder, shortly before half-time – actually came from a set-piece. In the second half, Chelsea’s higher starting positions interrupted Arsenal’s previously short build and forced goalkeeper Bernd Leno to kick more long balls his front men failed to win. The more Arsenal tried to play through or around Chelsea’s higher press, the more men the visitors committed to the press, with Jorginho in particular moving very high. The only real chance the hosts engineered in the second half came from poor build-up from Chelsea, as both teams struggled against the committed high press. Out of possession, Arsenal remained in their 4-4-2 diamond mid-block. Ramsey stepped on to Jorginho wherever possible, while Xhaka blocked off access into the feet of Eden Hazard. Guendouzi and Torreira were responsible for the movements of Kante and Kovacic. 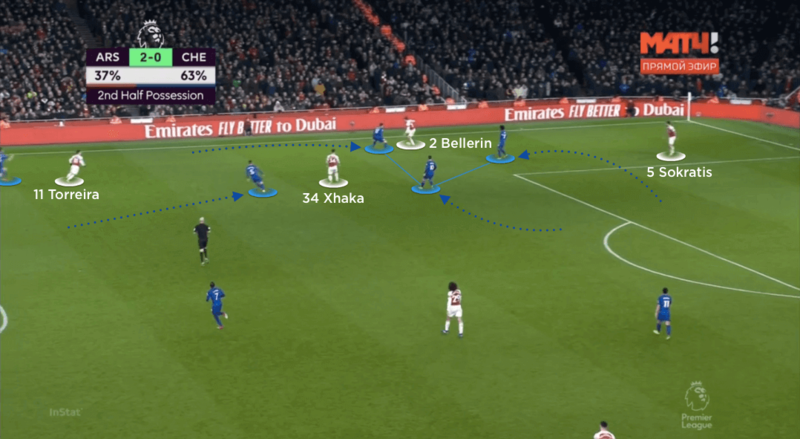 Arsenal’s back line was occupied by the narrow structure of Chelsea’s front three, which naturally left spaces in the wide areas for the visitors to exploit with direct balls in behind for runners. 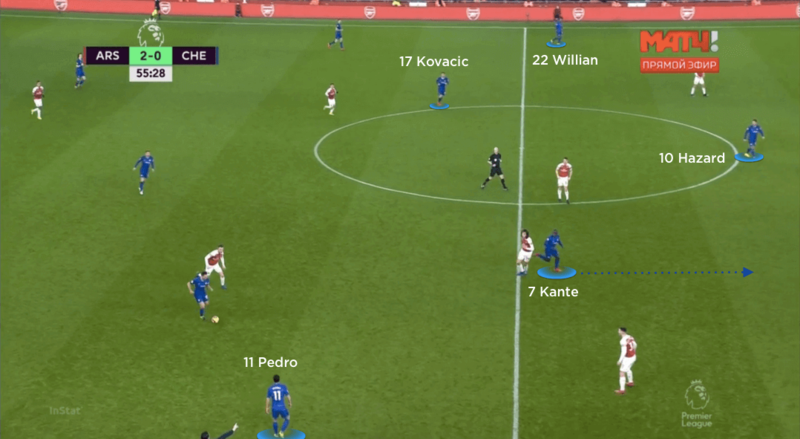 Quick and direct movements from both Pedro and Willian gave a clear warning of what Chelsea can offer, but Arsenal’s central compactness was outstanding. And, without a central player to attack crosses, Chelsea’s attack was largely ineffective in such a tightly congested space. The Gunners did become horizontally stretched in the second half, as Chelsea’s wide men – rather than the full-backs – provided the width. Although the visitors looked threatening, with Willian in particular proving a menace, Arsenal held on for three huge points in the battle for fourth place. 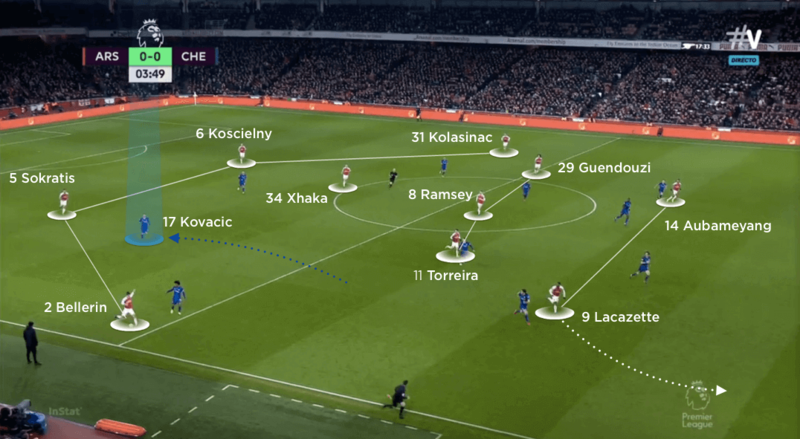 Arsenal set up in a 4-4-2 diamond formation, but Mateo Kovacic’s forward movements to press the Gunners’ back line meant N’Golo Kante and Jorginho were often overloaded by three midfielders. The wide movements of the Arsenal front two prevented Chelsea defenders from stepping up to redress the numbers. 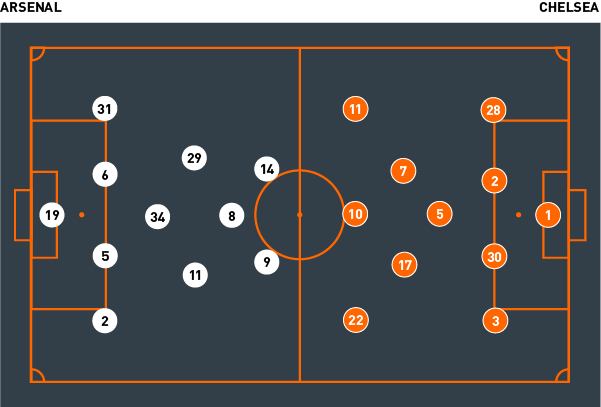 The hosts maintained their 4-4-2 diamond when defending, yielding control of wide areas in order to maintain central compactness. Arsenal persisted with their unsuccessful short build in a poor second half, even as Chelsea’s higher-pressing midfield and attacking units forced the ball into difficult areas. 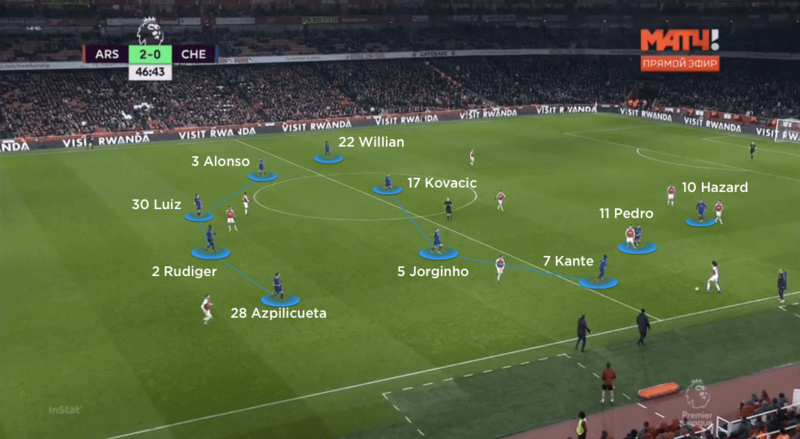 With Arsenal so centrally compact – and Aaron Ramsey occupying Jorginho throughout – Chelsea looked to their full-backs to provide attacking penetration. However, their attackers offered little against Arsenal’s powerful central defence. 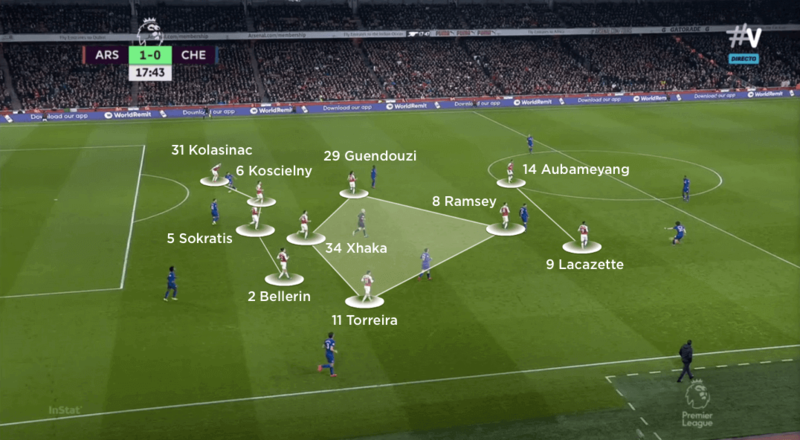 The visitors employed their usual 4-3-3 structure when defending, gradually moving from a mid-block into a higher press – especially as Arsenal looked so uncomfortable building from deep in the second half. Chelsea eventually moved their wingers further out to horizontally stretch Arsenal’s back line. This created much more central space and access into the feet of Eden Hazard, who was then supported by inside runs from Kante especially. Chelsea began the match in their usual 4-3-3 attacking structure, with Eden Hazard as the central number nine in between Pedro and Willian. Early access into Hazard was difficult, as the Belgian was surrounded by both Arsenal central defenders and Granit Xhaka. He tried to drop far away from the back line to link Chelsea’s central build, but the visitors then lacked a central attacking presence against Arsenal’s back line. The visitors soon pushed both Pedro and Willian further inside, hoping to bring Arsenal’s defensive markers away from Hazard. Further back, Jorginho was persistently man-marked by Aaron Ramsey, as Chelsea struggled to link defence with midfield from the central lane. 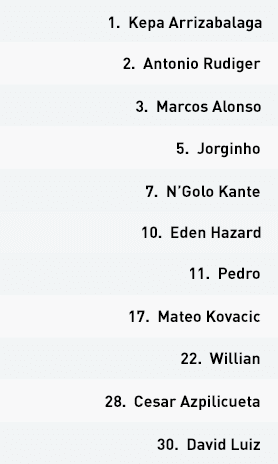 However, as Pedro and Willian stayed inside, and with Hazard now much higher again – Arsenal’s entire back line was eventually pinned back by three players. With the hosts leaving both strikers and Ramsey higher up, Chelsea looked for direct balls in behind, with Pedro and Willian ideal narrow runners to receive sweeping passes from David Luiz in particular. This caused Arsenal to drop back into a deeper and more compact block, which in turn created space for delayed runs forward from full-backs Marcos Alonso and Cesar Azpilicueta. The visitors worked the ball into them numerous times in the final third, but once more the lack of a genuine presence in the opposing area cost them – Alonso’s header late in the first half was the closest the visitors came to getting on the scoresheet. In the second half, Hazard received more balls into feet, and in dangerous positions within the central lane. Pedro continued to provide width from the right, while Alonso took advantage of Willian’s runs inside to advance down the left. 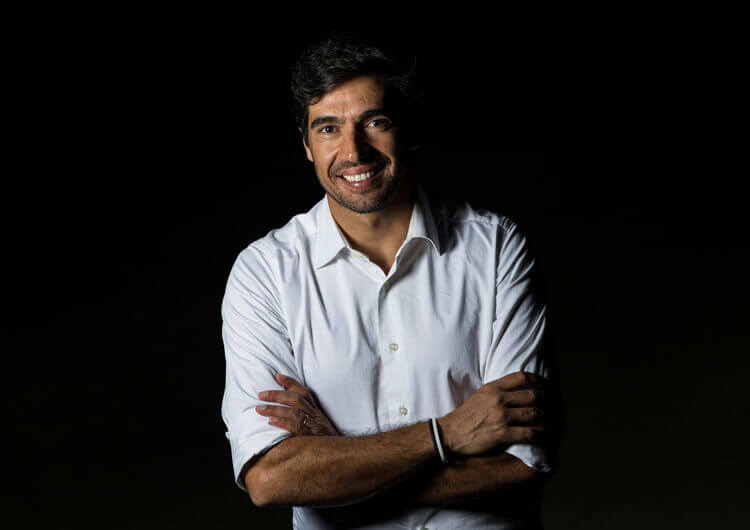 The Brazilian’s pace and directness with the ball gave Chelsea another option to attack around Arsenal’s block, but in truth they never consistently managed to break down a well-organised defence. Even with the eventual introduction of Olivier Giroud, the Blues couldn’t penetrate through, around or over Arsenal’s deep low block. Off the ball, Chelsea maintained their 4-3-3 structure, and were caught between a mid-block and a high pressing strategy. As Arsenal worked the ball across their back line, it became the responsibility of the two advanced central midfielders – Mateo Kovacic and N’Golo Kante – to step forward and help Hazard press the ball. However, this left big spaces within the inside channel, especially on Chelsea’s left. Jorginho limited the impact that Ramsey had in central areas, but the visitors struggled to press the ball high and block off inside movements from Lucas Torreira in particular. Kante and Azpilicueta provided more defensive stability on the right than Alonso and Kovacic, which forced Arsenal to adapt their build from the left side. The hosts also looked vulnerable to higher pressing as they restarted with short passes deep within their own defensive third. Despite looking the more likely side to score, the visitors conceded a second goal, again from the second phase of a set-piece delivery. Torreira’s diagonal free-kick wasn’t dealt with, as Koscielny managed to beat five Chelsea defenders to the ball from Sokratis’ second ball into the box and divert the ball home. Chelsea were rarely tested in the second half, as their higher press ensured Arsenal’s deeper build was mostly unsuccessful. Whenever Bernd Leno kicked longer into Arsenal’s front line, David Luiz and Antonio Rudiger were more than comfortable – but while Chelsea were able to continue their dominance of the ball, and the half, they never looked like finding a way back into the game and ultimately fell to a very disappointing defeat.